November is here and it’s time for you to submit your next photo with a new theme in Dunkin’ Donuts Mug Up contest. Are you ready to hear what it is? It’s a silly Mustache Theme! I mustache you a question. How do you take your coffee? 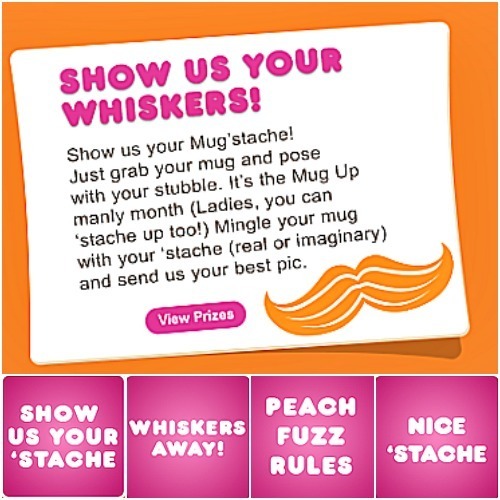 Dunkin’ Donuts is celebrating mustaches in November by asking you to share your favorite photo of you, your dream mustache, and its favorite mug buddy here. Mug Up this month for a chance to win a year’s supply of Dunkin’ Donuts coffee, a $250 VISA gift card or a Dunkin’ Donuts coffee mug.